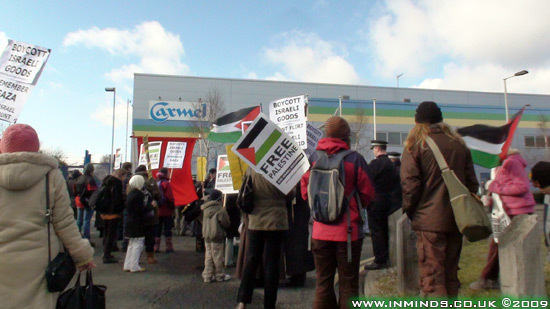 This protest is to highlight the overwhelming public opposition to the sale of Israeli goods and in support of Palestinian farmers who are not able to market their goods internationally. 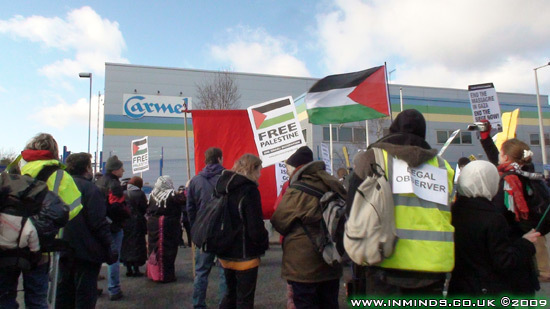 The picket aims to expose this company's complicity in murder, theft and damage of occupied land, collective punishment, apartheid, ethnic cleansing, and other breaches of International Law to public scrutiny. 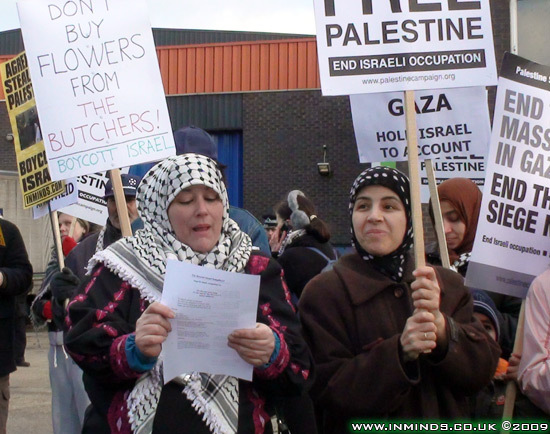 “The aim of the protest is to draw attention to this company's sale of flowers from occupied Palestinian land on Valentines Day. 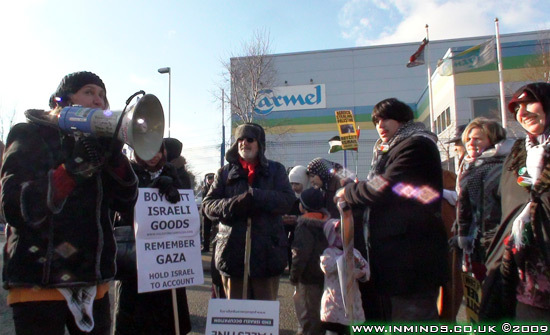 We are asking the British public not to buy blood stained flowers for their loved ones this year – Our aim is to shut their operations down for the day.."
Following the murder of over 1,300 people and the maiming of nearly 6,000, the majority women and children in Gaza, it is vital that we keep in the public consciousness that by purchasing Israeli goods they are supporting the slaughter of innocent people. 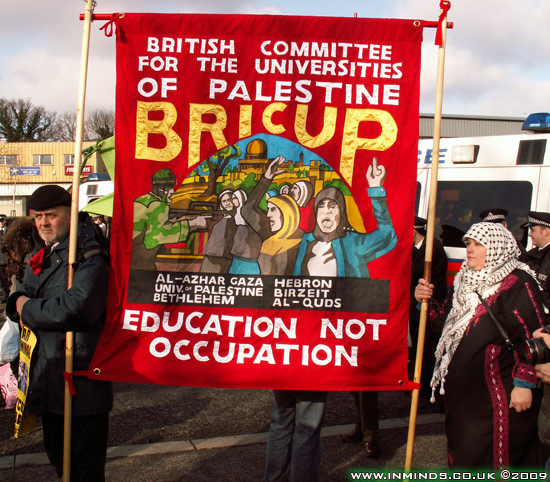 Actions like the one on Saturday are a chance for the British public to show solidarity with the Palestinians who are suffering war crimes at the hands of the Israelis. 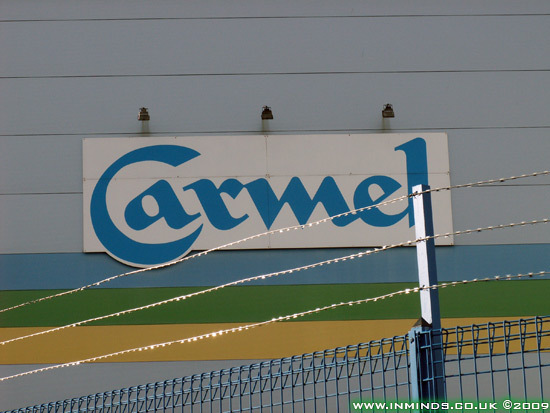 Carmel Agrexco, a state owned company, is at the heart of Israel's colonisation and exploitation of Palestinian land"
Carmel Agrexco is the largest importer of illegal settlement goods into the UK. 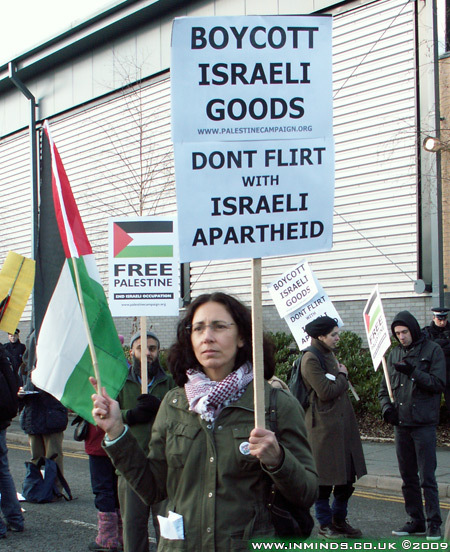 The Valentines Day period is one of their most profitable as the company imports thousands on tonnes of fresh flowers from Israel and the illegal settlements. Shoppers on the British high street probably know Agrexco better as the Carmel, Coral and Jaffa brands importing a wide range of produce including peppers, tomatoes, strawberries, herbs, spices, flowers and avocadoes. The lawfulness of Israeli settlement produce is neither a ‘grey area’, nor an exclusively ‘political issue’. 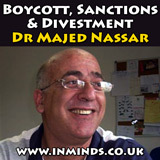 Making money from war crimes and crimes against humanity is a criminal offence. 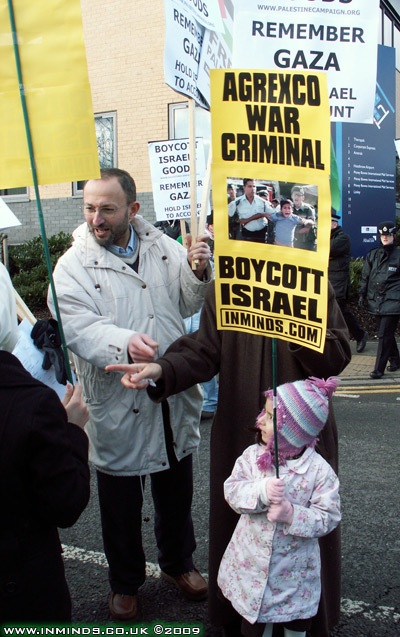 Israeli settlements in the West Bank are by their very nature a war crime, and the apartheid system which accompanies them is a crime against humanity. 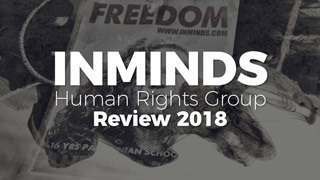 A secret Israeli government report was recently leaked by Israeli human rights group Yesh Din to the Israeli newspaper Haaretz (see here ). It details Palestinian landowners who have been pushed off their land by Israel’s settlement program. 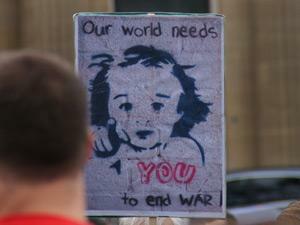 War crimes and crimes against humanity are the most serious offences a person can commit. They do not need to be written into domestic Law to be binding, although in the UK these crimes are indeed incorporated into domestic law. Given this, there is an irrefutable obligation on the law enforcement agencies to enforce this area of Law. Their refusal to do so is as incoherent as it is unjust. 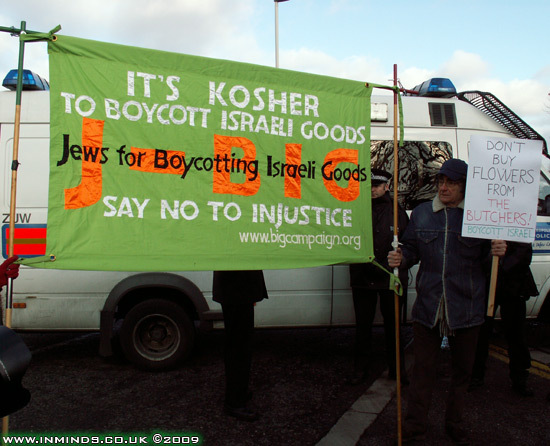 In order to highlight this incoherence and injustice, activists have turned to direct action in order to disrupt the illegal trade of settlement goods. While the police are unwilling to prosecute the companies involved in this illegal business, convicting people of peacefully disrupting serious criminal activity presents something of a problem. This has become most evident at Agrexco. 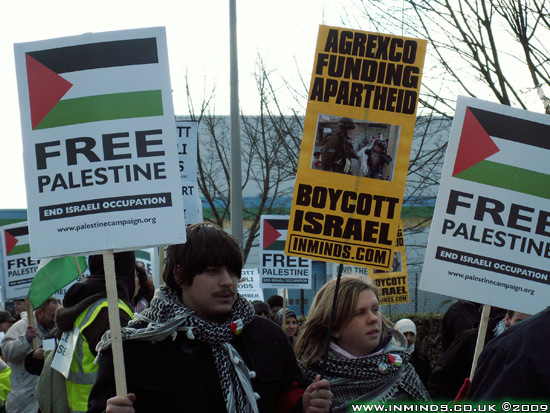 Agrexco is a 50% state owned company, which imports products both from within Israel and the West Bank. 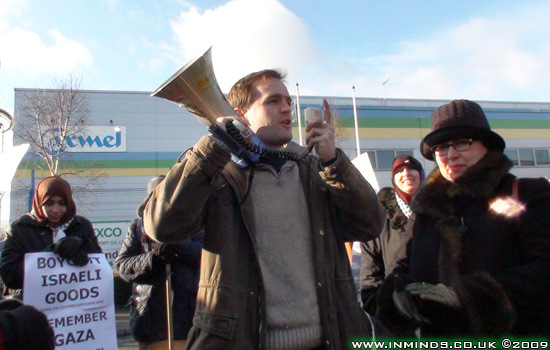 Over the past three years activists have routinely disrupted Agrexco’s activities at their depot in swallow field way, Hayes. Protestors have stormed the depot, blockaded the gates, and have dumped builders rubble and horse manure at the entrances. However, despite a steady increase in the frequency of the disruptions, police seem reluctant to arrest. On one action a police officer told an activist that the police were not going to “play ball”. By “play ball”, he meant having Agrexco’s criminal activity exposed in court. In 2006 seven activists were tried for disrupting Agrexco’s business. 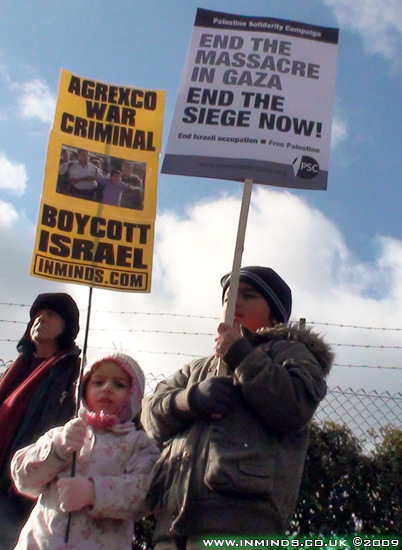 For the trial, the court ordered Agrexco to disclose trading records which proved that Agrexco had been trading with the West Bank settlements of Tomer, Mehola, Hamra, Ro'i, Massua, Patzael, Mekhora, Netiv Ha-Gdud and Bet Ha-Arava. 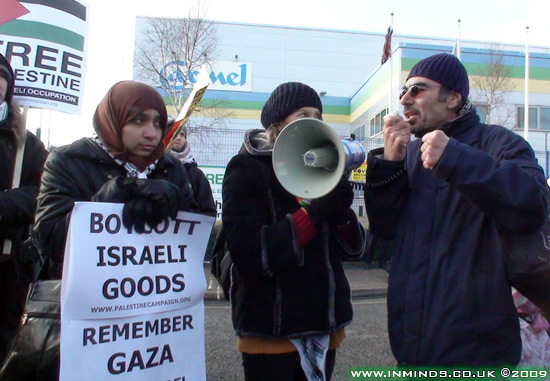 In January Activists occupied Ahava cosmetics store at Monmoth Street in central London. Ahava’s ‘dead sea cosmetics’, are manufactured on an illegal settlement called Mitzpe Shalem in the West Bank, using minerals extracted from Palestinian areas of the dead sea. 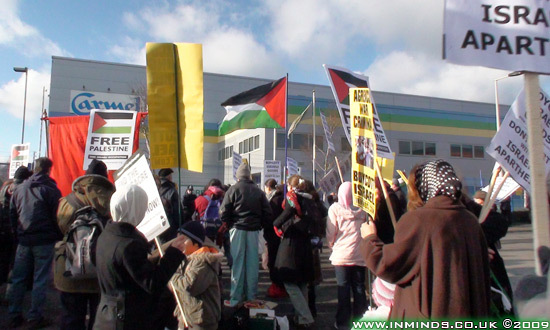 There has also been a peoples decommissioning a weapons factory ITT/EDO MBM in Brighton, which makes components used in Israeli bombs. 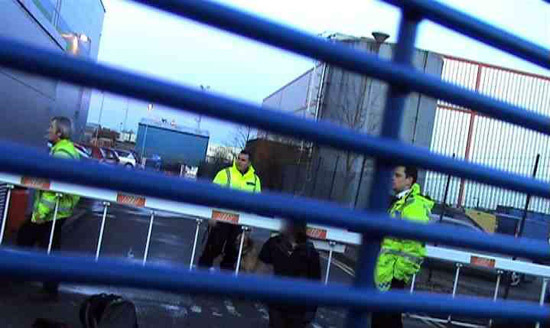 Nine people were arrested after what police estimate to be £250, 000 worth of damage was done to the factory. 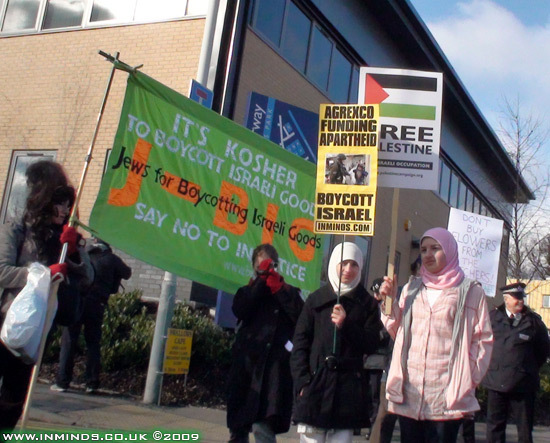 These actions also form part of a wider call to boycott all Israeli produce in light of Israel’s persistent violation of international humanitarian Law. 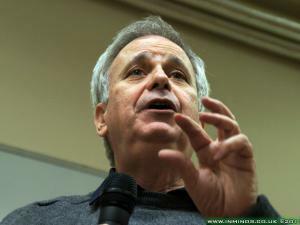 Israel recent massacres in Gaza highlights the need for an international movement capable of holding Israel to account. 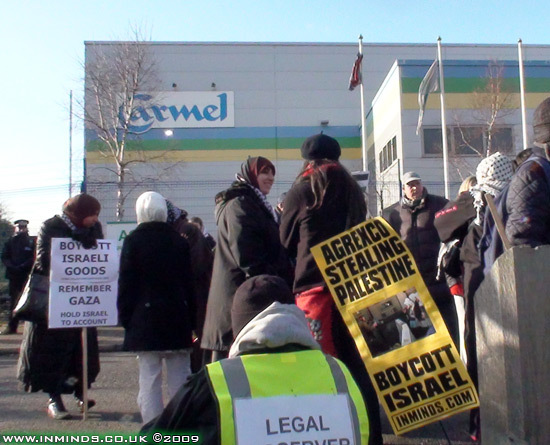 There has been a call out for a week of direct action against settlement businesses including Ahava and Agrexco between the 7th and the 14th of February. 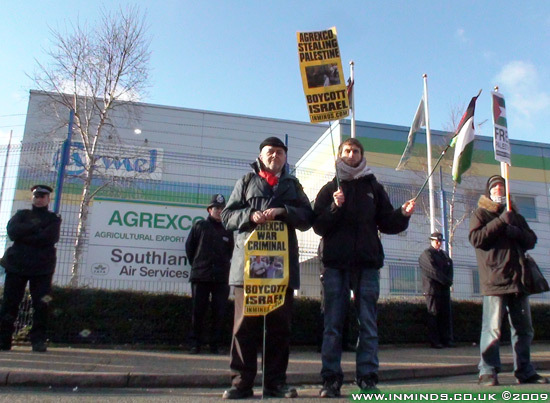 Join us in the demonstration at Agrexco HQ in Hayes, Middlesex, on Saturday 7th - from where we know for certain that masses of Israeli lowers will be despatched to florists and supermarkets in the days before Valentine's Day. 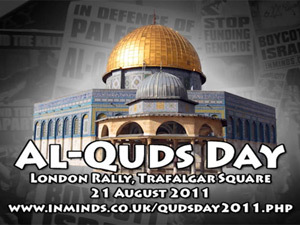 We need lots of people there to show Agrexco we mean it, and to hold Israel accountable. Bring imaginative placards.How to get thereBuses will leave from Victoria station London at 11 a.m., returning by 6. 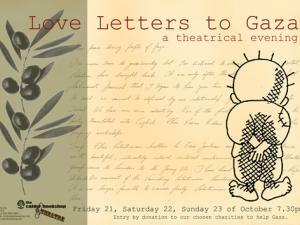 Phone 0207 7006192, or email psc.admin@palestinecampaign.org to book a return place (£8, £6 concessions).By road. The Agrexco HQ/Depot is in Swallowfield Way, Hayes, Middlesex, near Heathrow airport. 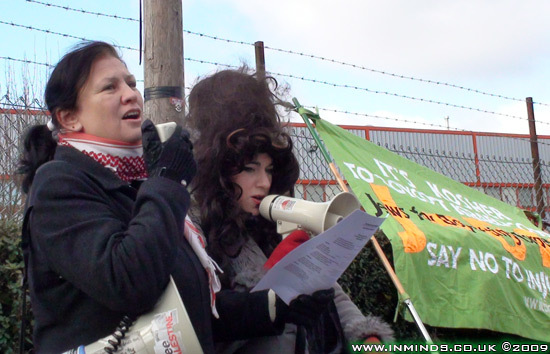 The film follows activists as they aim to close Carmel Agrexcos main depot near Heathrow on the Saturday before Valentines Day, the busiest period for the sale of flowers. 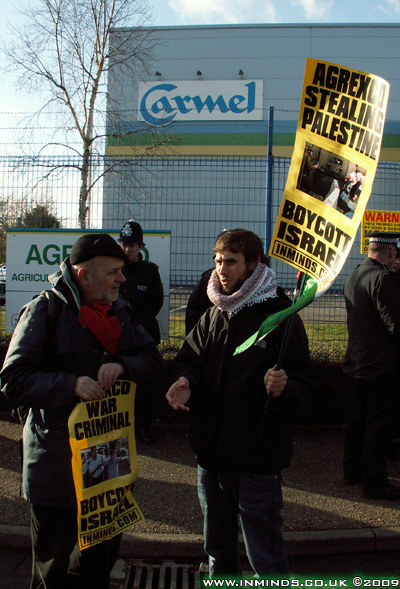 Carmel Agrexco, owned by the Israeli government, is responsible for importing 60-70% of all produce grown on stolen Palestinian land in the illegal Israeli settlements (flowers constitute 17% of this). Title of film is "For Anwar". Anwar Il Ibrim was a Palestinian farmer who was shot dead two weeks before this demo by the Israeli army in his parsely field whilst picking his harvest - a single bullet through the neck. His mother explained that Anwar was her only son, he had gone to work the field that day to raise money to buy medicine for his ailing father who is paralysed. Carmel Agrexco Depot. 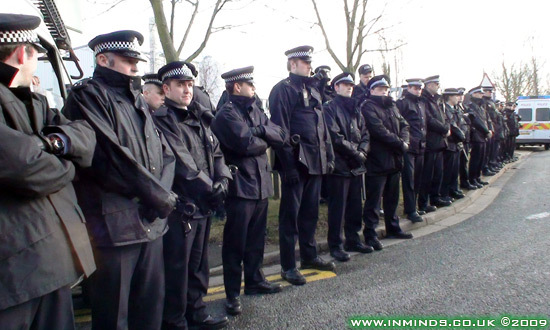 When activists arrived at 7:30am they found 40 policeman were already there guarding against any blockade! A police spokesperson revealed they had been there all night and that they intend to stay for the rest of the day. 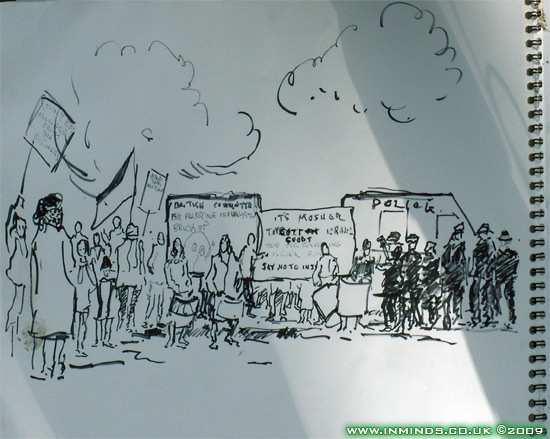 84 year young artist draws parallels between support for nazis in the 30s to todays appeasment of Israel. We see your products in Tesco. We're going to boycott them all. They're all against the law. 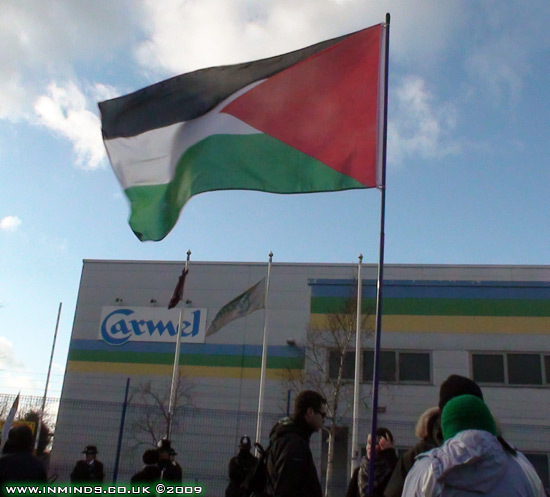 Not clear if it was removed because it was proving to be a business liability..
or whether it was to prevent a repeat of previous action when activists replaced it with a Palestinian flag! 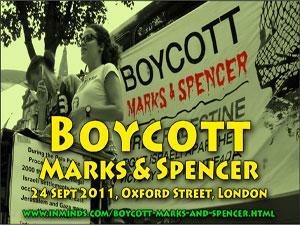 Please join the boycott and help them too. 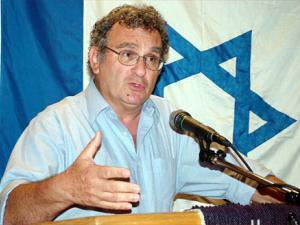 Things made in Israel start 7 2 9. 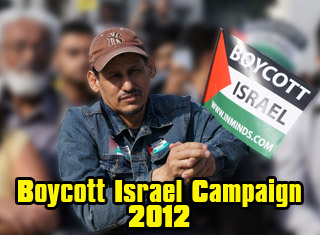 Yes join the boycott and help them too! We hear good news - due to the success of previous actions Agrexco upon learning of todays action had shut down their own depot on its busiest Saturday for flower sales! Not all good news - we learn that Agrexco had outsourced the flower packing to another company further up the road - Cargoflora. 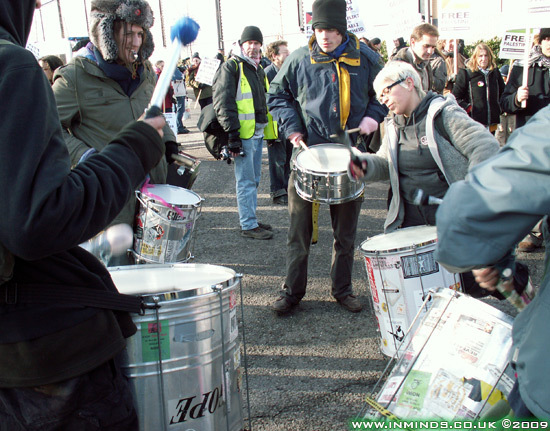 With the Agrexco depot shut down we decided to vist Cargoflora - the Samba band lead the way.. The flowers are grown in illegal settlements on Palestinian land and therefore constitute illegally traded goods. The women say that they will blockade Carmel Agrexco until they are cut from the gates and arrested. 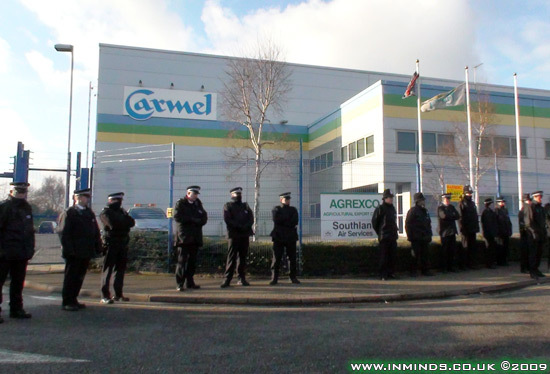 Two days before Valentines day a group of 15 women have locked themselves to the gates of Israeli export company Carmel Agrexco to stop the delivery of Valentines roses. The flowers are grown in illegal settlements on Palestinian land and therefore constitute illegally traded goods. The women say that they will blockade Carmel Agrexco until they are cut from the gates and arrested. 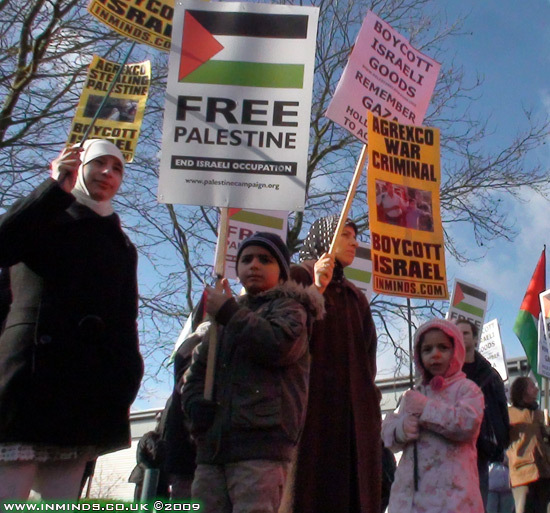 "Actions like this are a chance for us to show solidarity with the Palestinians who are suffering war crimes at the hands of the Israelis. This Valentines day, women in Palestine will be struggling to piece their society together against the brute force of the occupation. 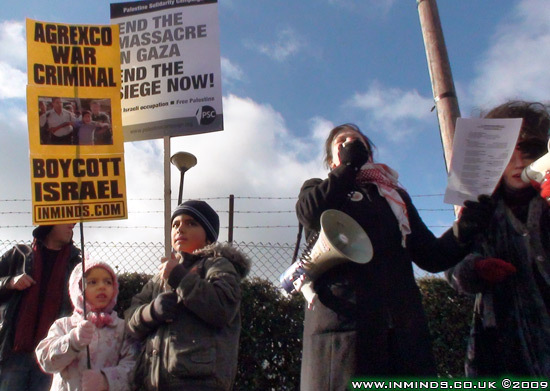 The world did nothing as over 900 people were killed in Gaza last month. 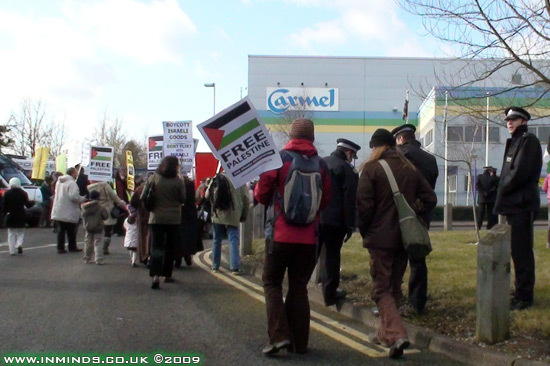 Carmel Agrexco, a state owned company, is at the heart of Israel's colonisation and exploitation of Palestinian land"
Carmel Agrexco is the largest importer of illegal settlement goods into the UK. The Valentines day period is one of their busiest as the company deals with large amounts of fresh flowers from Israel and the settlements. 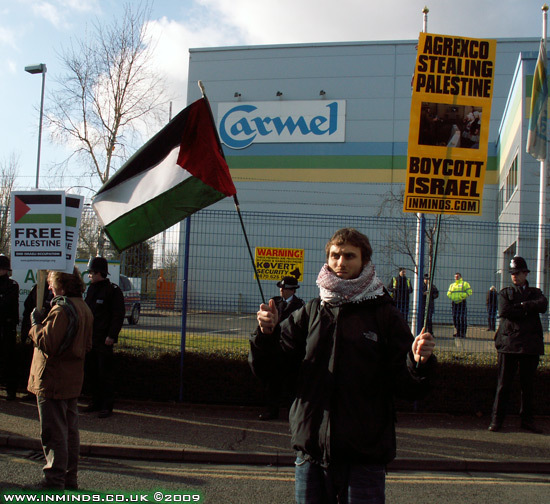 In the UK Agrexco is known under the Carmel, Coral and Jaffa brands. The UK is the most important foreign market for Israeli fresh produce. Agrexco exports a wide range of produce to the UK including peppers, tomatoes, strawberries, herbs, spices, flowers and avocados. 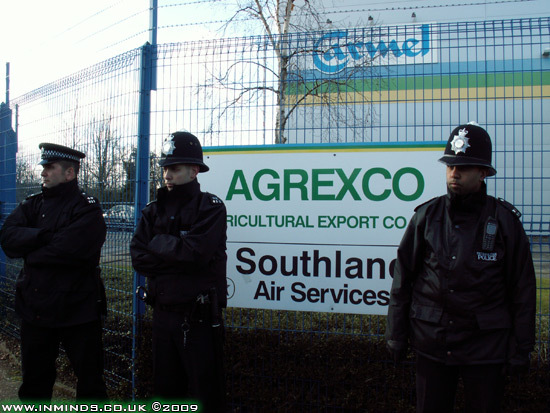 Agrexco is the largest exporter of settlement produce for sale overseas. Much of this produce comes from colonies in the Jordan Valley. Carmel Agrexco have had dealings with the colonies of Tomer, Mehola, Hamra, Ro’i, Massua, Patzael, Mekhora, Netiv Ha-Gdud and Bet Ha-Arava. 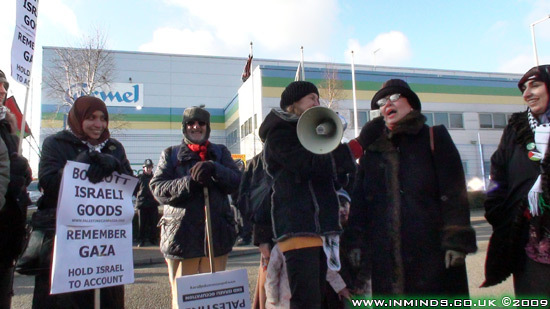 Previously there have been six blockades of this company stopping work at the factory. The company persistently refuses to press charges against the activists because they are scared of having to prove the legality of their business in open court. 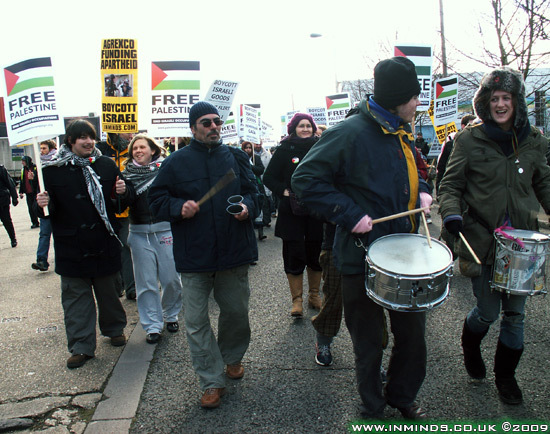 This follows from actions of 11th November 2004, when Palestine-Solidarity protesters from London and Brighton were arrested after taking part in non-violent blockades outside the same company and 30 August 2006, when demonstrators blockaded the company for 11 hours and no arrests were made. 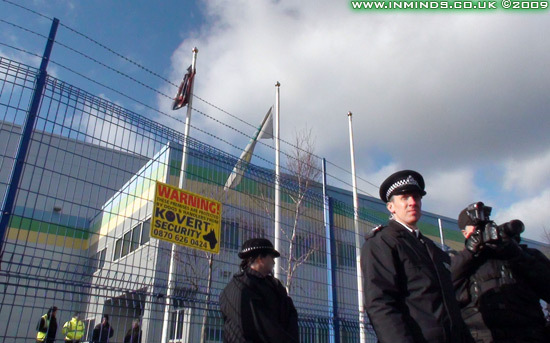 In September 2005, a Judge ruled that Agrexco (UK) must prove that their business is lawful. 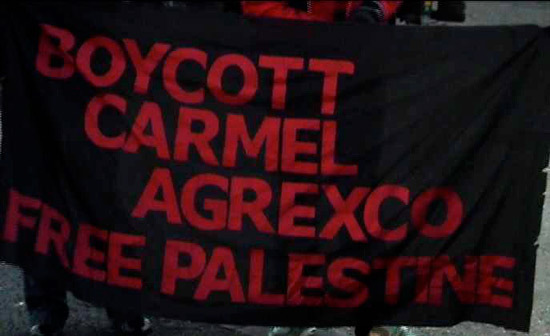 The acquittal of the seven activists before they were able to present their defence meant that the court did not have to rule on the legality of Agrexco-Carmel’s involvement in the supply of produce from illegal settlements in the occupied West Bank and Gaza Strip. 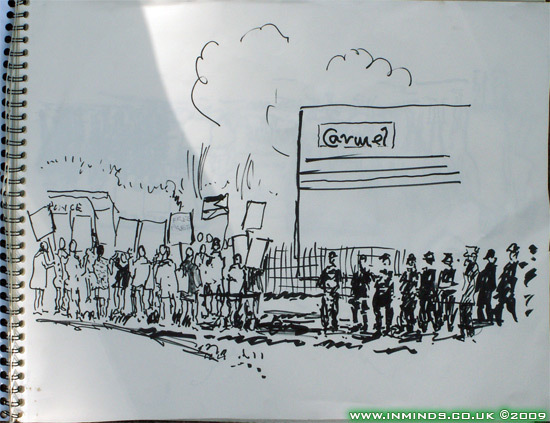 In September 2006 protesters blockaded the company again, Carmel refused to have demonstrators arrested because this would have lead to another embarrassing court appearance where their business methods would have been investigated by a British court of law. 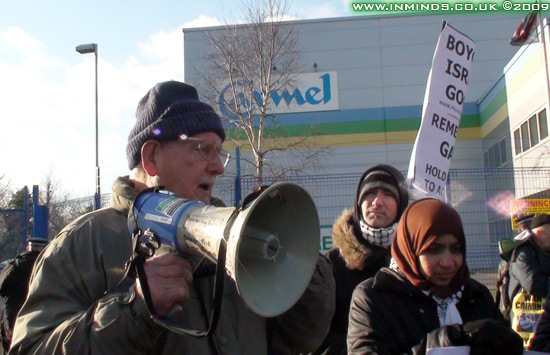 Since then the depot in Middlesex has been the subject of sustained campaigning. This is the third Valentine's Day pickett of the premises. 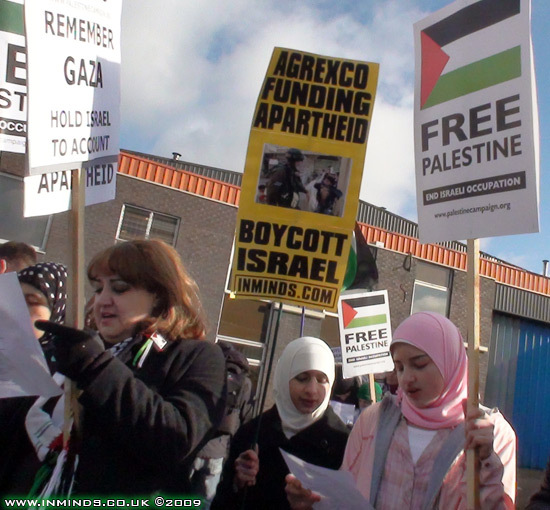 The picket aims to expose this company’s complicity in murder, theft and damage of occupied land, collective punishment, apartheid, ethnic cleansing, and other breaches of International Law to public scrutiny. Three of the activists have been violently arrested. Another update (12:30 am). 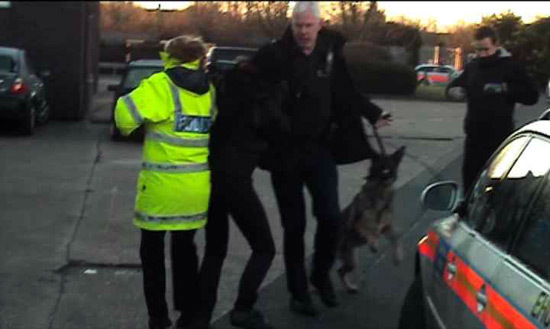 All 3 arrested have now been released, 2 bailed to return in a month. One of the women was locked in a van at the police station whilst the arresting officers searched the station for the van keys. After a long search and a lot of frantic talk on the police radio a police officer smashed a window of the van to get her out! At the moment people are arrested for: criminal damage, obstruct pc, sec 5, and assault PC. 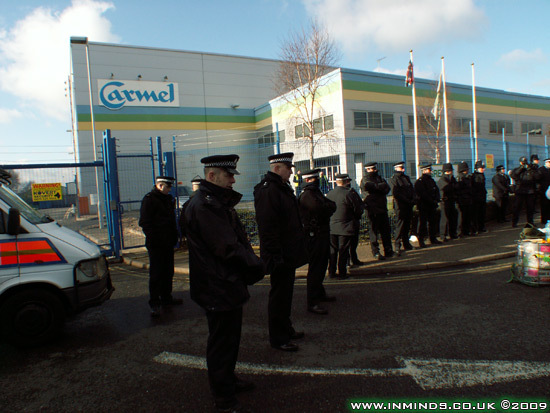 They were originally arrested for aggrevated trespass and criminal damage, but after 7 hours in custody the police informed them that Carmel Agrexco had made clear to the police that they do not want any charges pressed and that they were unwilling to provide the police with the CCTV evidence from the warehouse. Yet again they are colluding with the police to avoid an embarassing court case.